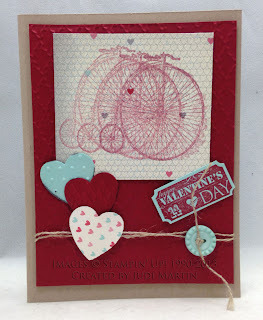 These Valentine's Day cards use Stampin' Up! 's More Amore Specialty Designer Series Paper (129309 $12.95) from the Spring Catalog. Coordinating colors are Pool Party, Primrose Petals, Real Red, Very Vanilla and Basic Black. You can see from these cards how well these colors all go together. This card was made by Marilyn Young. It uses the Honeycomb Textured Impression Embossing Folder (129378 $7.95). The hearts were made using the Small Heart Punch (117193 $5.95) and fit perfectly inside the honeycombs. 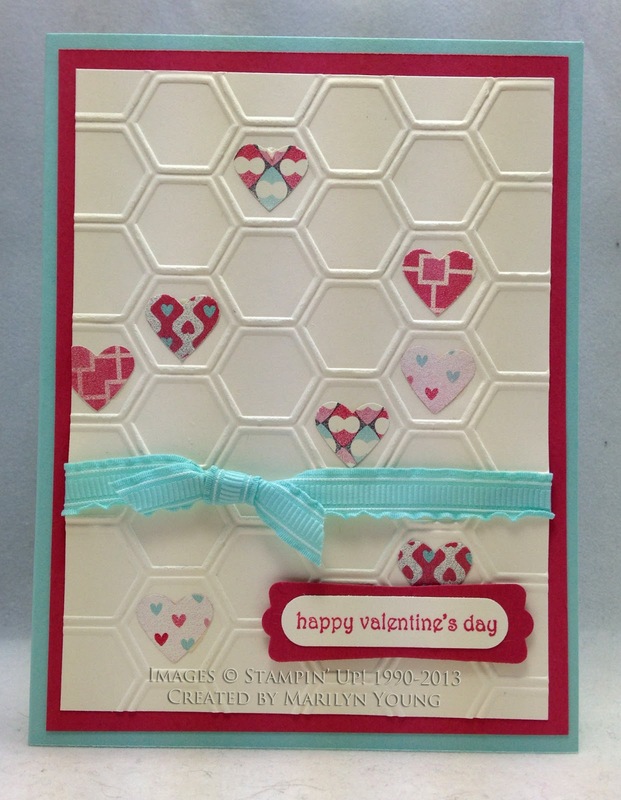 Janet Holmes made this card that shows how you can cut apart the hearts to use on separate cards. She also featured the new Designer Builder Brads (129329 $6.95). You get 16 brads in the package. You can use the circle punch from the Itty Bitty Shapes Punch Pack (118309 $16.95) to put an image in the center of the brad and then cover it with the epoxy bubble included with the builder brads. I used the last set of builder brads that Stampin' Up! offered a lot and like these even more. 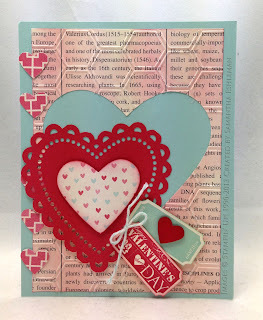 Karen Altizer made this card using the Happy Valentine Heart stamp from the Valentine Treat Bundle which is only available through January 21st. This bundle (132771 $5.95) contains the exclusive Happy Valentine Heart Single Stamp and a package of 1" x 8" cellophane bags. The heart is easy to punch out with the Full Heart Punch (119883 $16.96). It takes longer to fill the bags when you make treats using this bundle than it does to stamp and punch out the heart. Judi Martin made this card using a couple of Sale-A-Bration items. Sale-A-Bration starts on January 22nd. You can get the exclusive Feeling Sentimental Stamp Set with the bicycle image and the Pool Party Button as part of the Sycamore Street Ribbon and Button Pack for free during this special one-time-a-year offer. When you spend $50 you can choose from 19 different free products or bundles. As Stampin' Up! demonstrators, we got to start celebrating Sale-A-Bration early. 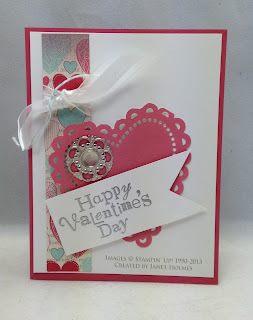 Judi also used the That's the Ticket Stamp Set (128075 $16.95) and coordinating Ticket punch (126883 $15.95) for the Valentine's Day sentiment. And in case you had not noticed, Judi likes to embellish her cards! The hearts were cut out with the new Hearts a Flutter Framelit Dies (130159 $24.95). And last, but definitely not least, is this card made by Samantha Eshleman. 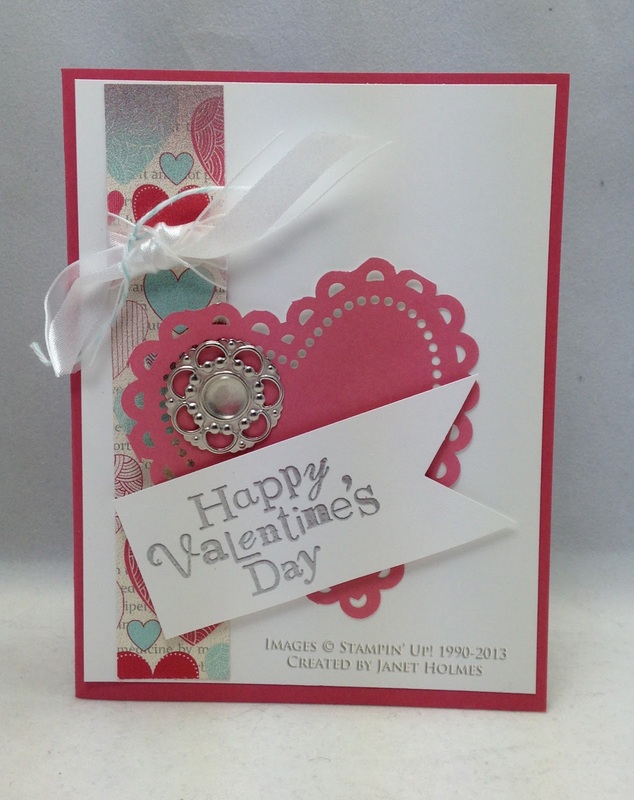 She has combined many of the same products in a different way using the Full Heart, Small Heart and Ticket Punches. 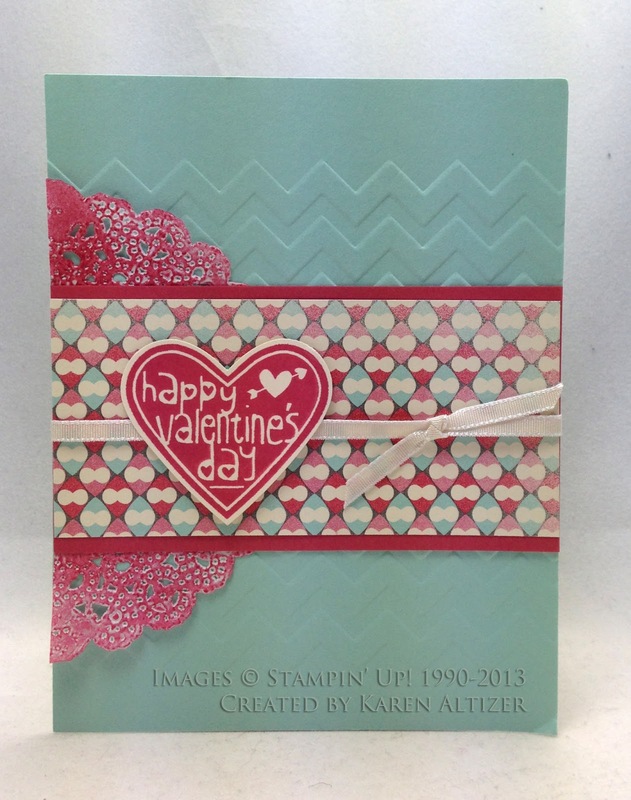 She used one of my favorite Stampin' Up! papers, First Edition Specialty Designer Series Paper (121878 $12.95). This light-weight paper looks like pages out of an old encyclopedia but it comes in 12 x 12 and it's acid and lignin-free. Visit my online store to get your supplies for these projects. The Valentine Treat Bundle is only available through January 21st. The Sale-A-Bration products will be available starting January 22nd. Remember that when you purchase $25 or more in product, you are eligible for my Rewards Program.